There are some activities that go perfectly before a trip to the pub. A horse goes before a carriage, privatisation and fragmentation of a railway network go before fatal lapses in safety standards, and a band practice goes before a trip to the pub. Actually, that’s music generally. Almost any kind of musical activity goes before a trip to the pub. Or during one. Anyway, it’s Thursday night and, having spent a tough couple of hours exerting my vocal cords, the call of the public house rings out louder than ever. 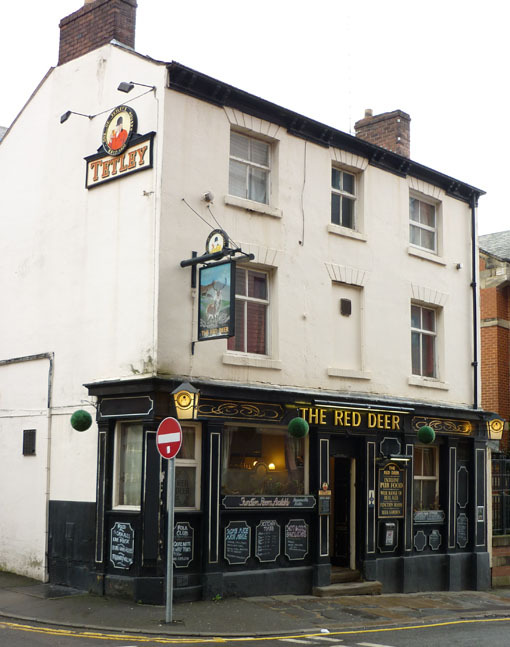 Instead of the Rutland Arms – a very fine pub which sits dangerously close to the rehearsal rooms – we opt this week for the Red Deer (pictured below). This is a lovely old pub which my friends and I have neglected a bit recently, in the middle of Sheffield but tucked cosily away off the main drag. It seems just the place after practice for a quiet pint. It seems it until we walk in, anyway, at which point we behold a Red Deer as busy as I’ve ever seen it before. My wordless, gaping face expresses grand astonishment, at which Cara bursts into laughter. The pub isn’t just full: it’s full of Young People. And it’s not just full of Young People: it’s full of Young People playing guitars and singing, and things like that. I know playing guitars and singing is technically sort of exactly what I’ve spent the last couple of hours doing. But there’s something not right about finishing a practice and then watching a gig. It’s like finishing a shift at a pizza takeaway and then eating takeaway pizza. Still, the Young People are all very nice and polite. It looks like some sort of open mic thing. Eventually we squeeze around a table, make ourselves heard to each other, and settle down for a couple of pints of something pale and refreshing. And the Red Deer is as pleasant as always, albeit in not quite the same way. That’s my lot until the weekend, when I’m in Cambridge for a wedding. Should the wedding venue be included on this blog? Initially I’d think not – but if I’ve counted somewhere like the Rutland Arms Hotel in Bakewell then consistency demands I count the bar at the Doubletree Hotel as well. That doesn’t mean I’ll ever drink there by choice, of course, and all the plush sofas we’re sitting on are paid for many times over by the staggering quantities of cash demanded for our drinks. Not only, then, does the Doubletree Hotel see nothing wrong in charging more than six pounds for a glass of wine: furthermore, I experience for the first time what it is to pay more than four pounds for a pint of beer (Murphy’s, since you ask). As the bar person reads the total off the till, a shiver runs down my spine. It feels colder than a usual shiver, because someone seems to have had the shirt off my back. Still in Cambridge the following day, a peaceful stroll around the city with my in-laws takes a deeply shocking turn with the suggestion that we go and have some lunch at a pub. The nearest pub to our hotel is a Greene King pub called the Anchor, but fortunately for us, there’s nowhere left to sit, so we walk round the corner to the Mill instead. And the Mill turns out to be pretty good. There’s a pint of something pale and refreshing, and it’s from a brewery just up the road. Lunch is decent and not too dear for Cambridge (we’ve just walked through a market selling loaves of bread for £3). Best of all is the service: every member of staff is friendly and cheerful, and it does them enormous credit that they retain composure throughout our convoluted, chopping-and-changing food order. One member of staff in particular (the oldest, so perhaps the manager) is a delight, in good humour and chatting to my little son. Good stuff. 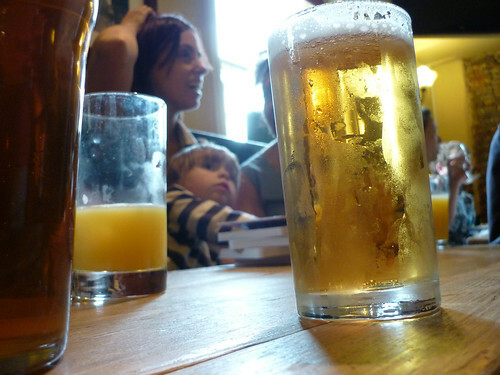 Again, it’s a busy pub, and our group of six adults and one child is squeezed around a table that’s too small for us. So we’re all knives and forks and elbows. It’s awkward, but we’re just about coping.